The idea took hold, and soon Yoerger, Madin, and WHOI biologist Annette Govindarajan were in a brainstorming frenzy. What emerged from that brainstorming session was a plan for a small, autonomous robot that could hover under water like a jellyfish, gathering high-resolution images of its targets. For the Mesobot to work the way Yoerger and his colleagues envisioned, it would need to replicate the good characteristics of a research diver. The key was to enable the Mesobot to both hover and move as quietly as possible, so that it wouldn’t scare away the slow-moving animals it was trying to track or change their behavior. Yoerger also wanted scientists to be able to use the vehicle to also observe all kinds of other phenomena going on in the ocean, such as the movement of carbon-rich particles known as marine snow. From a robotics point of view, it wouldn’t be easy. But Yoerger relished the challenge. With initial support from a WHOI independent study grant and Yoerger’s Senior Scientist Chair funded by the Smith Family, he began to work on the Mesobot’s design. The project was a team effort, bringing together researchers from WHOI (Govindarajan, Jon Howland, Joel Llopiz, Chris German, and Peter Wiebe), the Monterey Bay Aquarium Research Institute (MBARI), Stanford University, and the University of Texas Rio Grande Valley. By the fall of 2018, with additional funding from the National Science Foundation, construction of the Mesobot was underway. The vehicle looks something like a 4-foot-tall, bright-yellow bar of soap, turned on one long edge. It weighs only about 350 pounds—small and light for a sea-going robot—and has enough battery power for missions lasting up to two days. 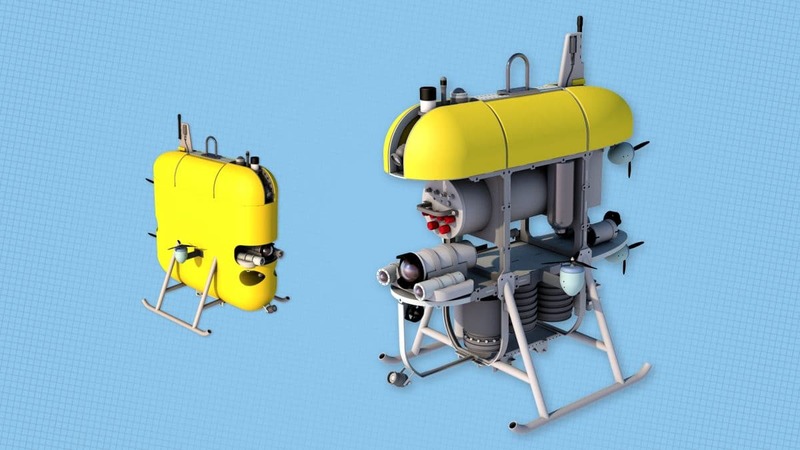 Like its cousin vehicle, the Deep-See, Mesobot will explore the deep, dim waters of the ocean twilight zone, hundreds to thousands of feet below the surface. But unlike the much larger Deep-See, the stealthy Mesobot will be able to follow individual animals, revealing subtle secrets about their behavior. To keep from disturbing the animals it’s trying to track, the Mesobot will maneuver by using six large, low-powered thrusters: two side thrusters, two vertical, and two aft. And its dimmable LED lights will be able to switch from white to red, a color that many twilight zone species cannot see. But what will really set Mesobot apart from other autonomous vehicles and samplers in WHOI’s fleet, says Yoerger, is its ability to follow elusive twilight zone species for hours or even days—and capture detailed images of their behavior. The vehicle will have two camera systems: a pair of stereo cameras for locating target animals so the Mesobot can follow them, and a camera to record what they do, in 4K video or 12 megapixel stills. Yoerger says the Mesobot should be ready for tank tests early in 2019 and take its first plunge into the twilight zone by the summer. Madin says he can’t wait to see what the Mesobot will discover hundreds of meters below the surface, far deeper than he could swim. 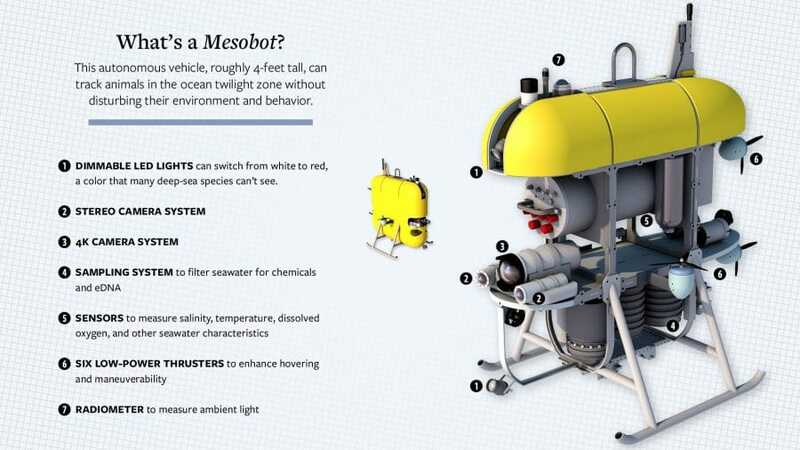 Funding to develop Mesobot came from a Andrew W. Mellon Foundation Award for Innovative Research, the Walter A. and Hope Noyes Smith Chair for Excellence in Oceanography at WHOI, the National Science Foundation, and the WHOI Catalyst Program.